The Presence of the Infinite sheds new light on the important subject of spiritual experience. Using the emerging insights of evolutionary spirituality, integral philosopher Steve McIntosh enlarges readers� capacity to have spiritual experience more abundantly and use it more effectively to improve their lives and the world around them. 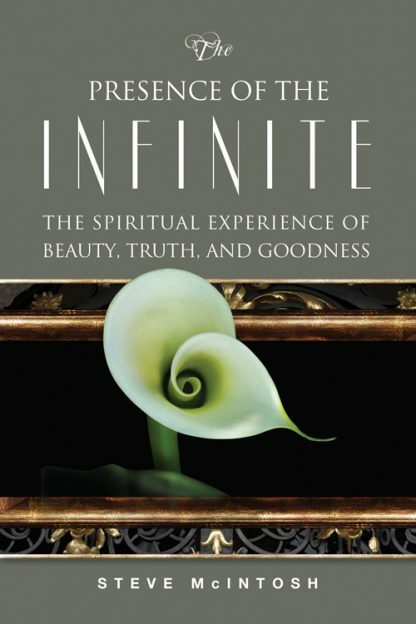 The Presence of the Infinite starts by providing a timely cultural analysis and critique of the various forms of spirituality that are vying for influence in contemporary American society. Building on this context, McIntosh shows how evolutionary spirituality overcomes the limitations of religious, secular, and New Age spirituality by better harmonizing science and spirit. Evolutionary spirituality�s transcendent potential is found in its deepening realization of the essentially spiritual qualities of beauty, truth, and goodness. McIntosh then uses evolutionary spirituality�s enlarged understanding of what spiritual experience is and how it works to consider the question of ultimate reality. This leads to an examination of conflicting ideas that regard spirit as either formless and nondual, or as loving and creative. By working to harmonize and integrate these alternative conceptions of ultimate reality, McIntosh shows how evolutionary spirituality can achieve a synthesis of nondual and theistic teachings of truth that can produce a spiritual renaissance in America and beyond. The Presence of the Infinite is destined to become a definitive text in the exciting new field of evolutionary spirituality. Steve McIntosh is a leader in the integral philosophy movement. He is co-founder and president of the Institute for Cultural Evolution (ICE) think tank. He is a graduate of the University of Virginia Law School and the University of Southern California Business School.